Last weekend we went up north for a little day trip to go Pop hunting. I was in charge of where we would eat. 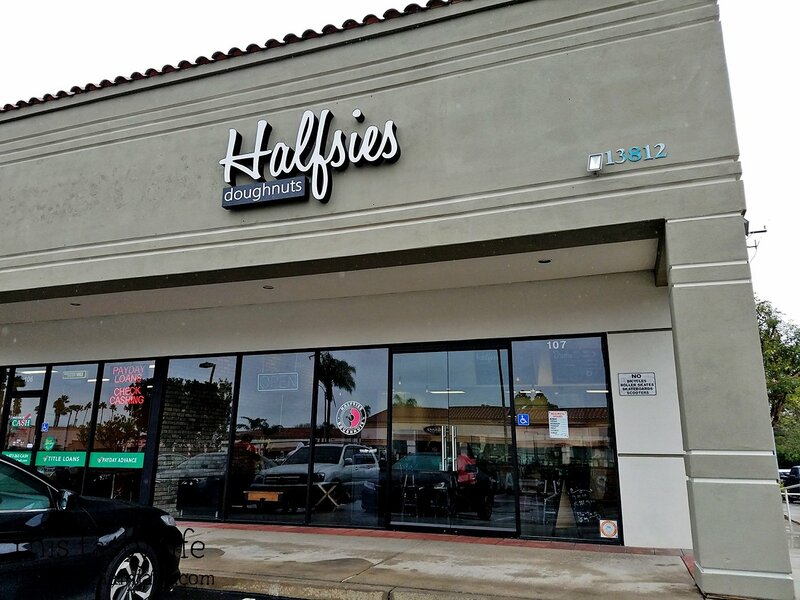 Our first stop that day was once again in Tustin but this time we visited Halfsies Doughnuts. It’s in a little trip mall right off the 5. Easy to get in and out. Also there was no line on a Saturday morning. Score. 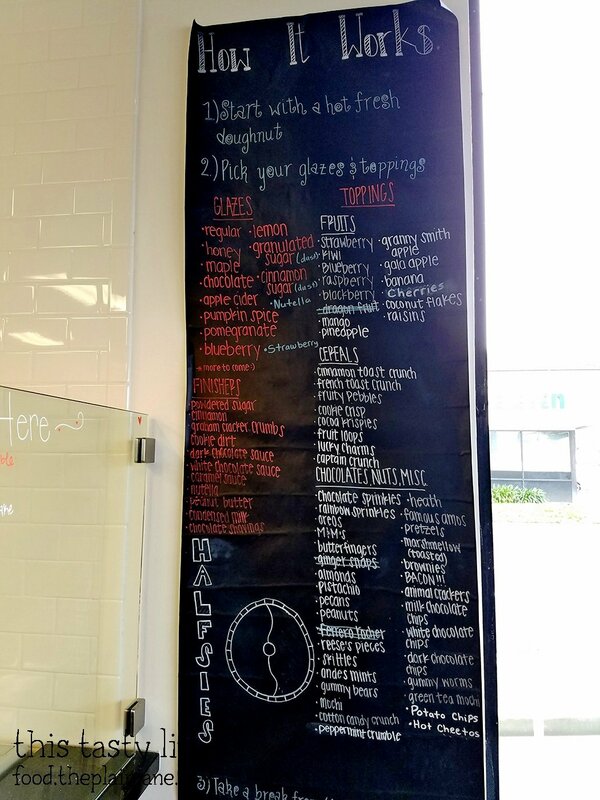 There’s a few ways you can get your doughnuts. You can get it with ice cream and make a doughnut sundae or sandwich. It was too early and too chilly for ice cream so we just went with making our own doughnuts. 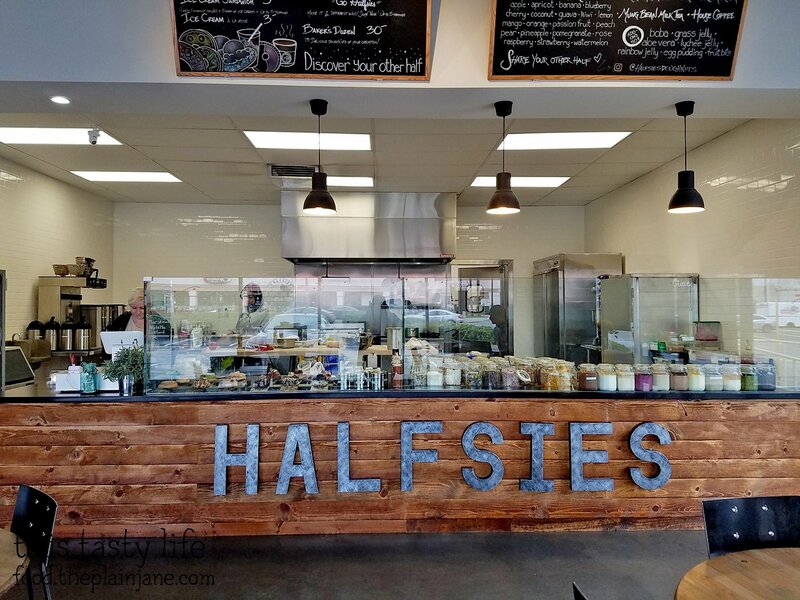 At Halfsies Doughnuts they are all about letting you make your own custom creation. As the name suggestions, you can make you two different halves completely different, if you so choose. 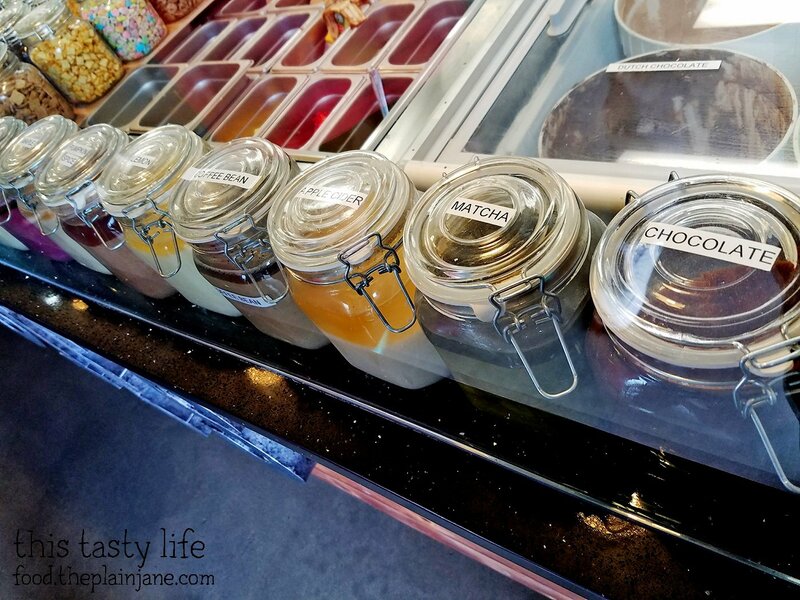 You pick your own glaze. You can add some fruit. 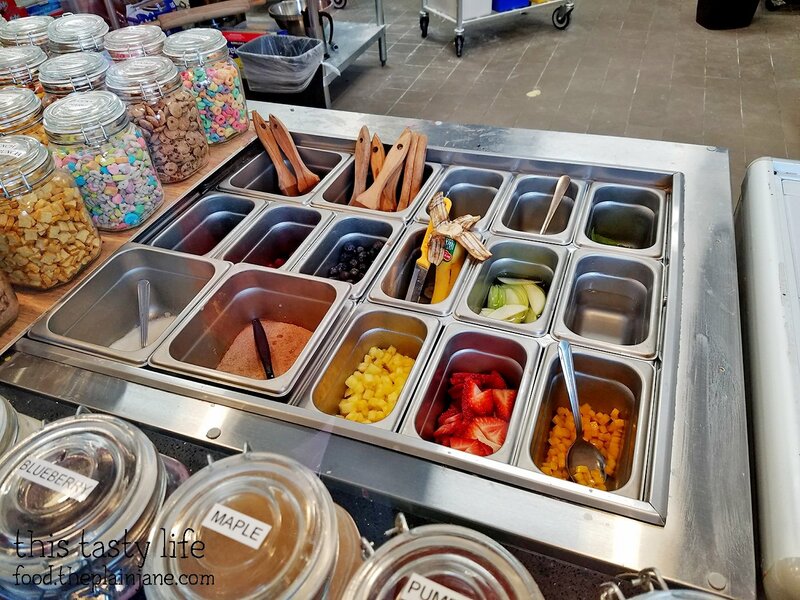 And your choice of toppings (up to five) for a mere $3. 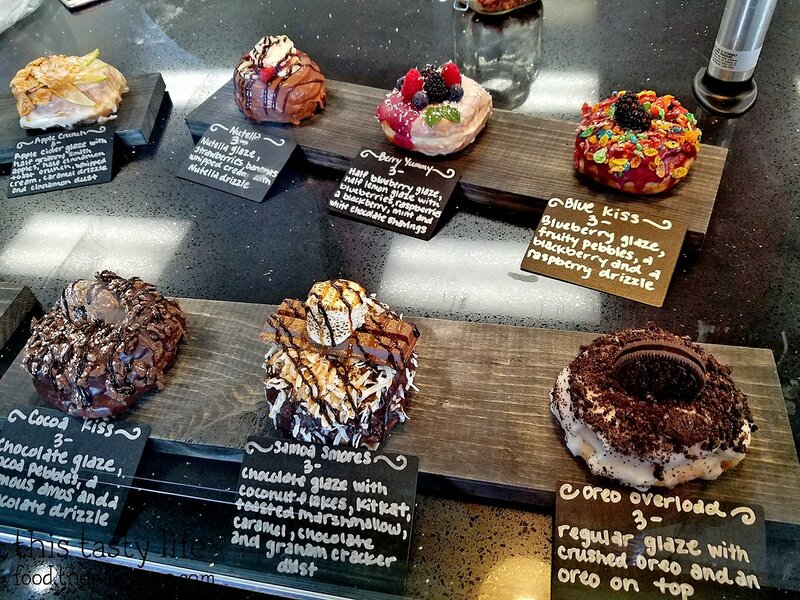 If the choices are too overwhelming for you, Halfsies Doughnuts also offers up their own pre made doughnuts for you to choose from. Some of these were quite tempting, I must say! 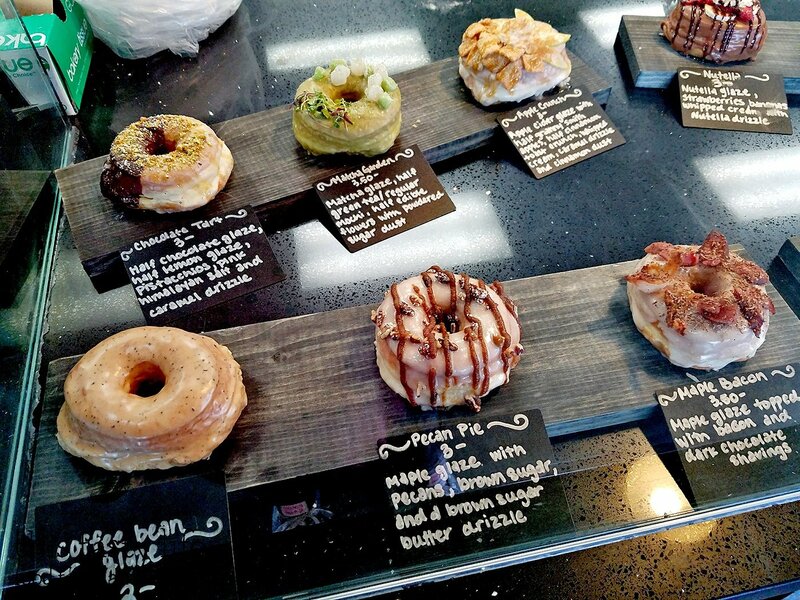 These pre made creations are all on their yeast doughnuts. 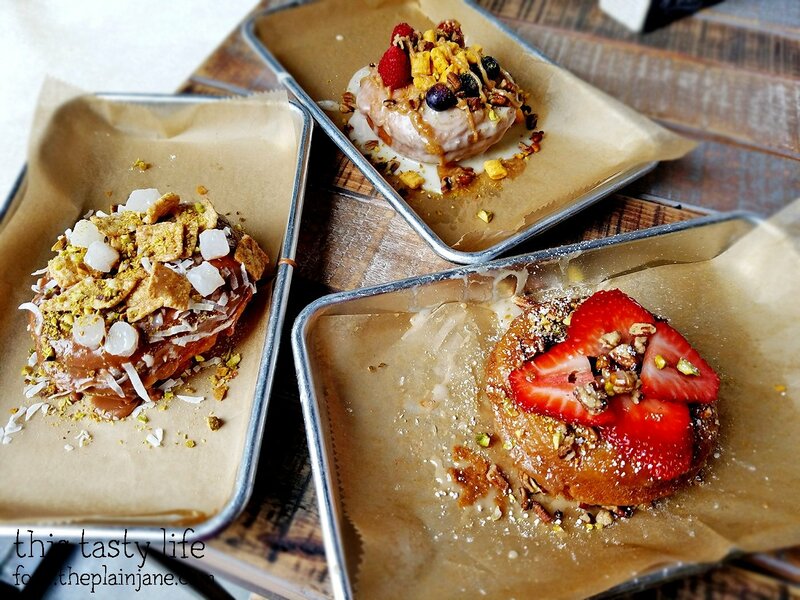 You have the option of choosing a yeast doughnut, a vegan doughnut, a gluten-free doughnut, or a freshly fried cake doughnut. Naturally all three of us went with the freshly fried cake doughnut. It’s not often you get to have a freshly fried made just for you doughnut! I kinda wish we had tried the yeast doughnut as well. One of the ladies working there told us the yeast doughnuts had been fried about 20 minutes prior to our arrival but we were still hung up on the cake doughnuts. Next time! All three of us had a hard time deciding what we wanted to get. 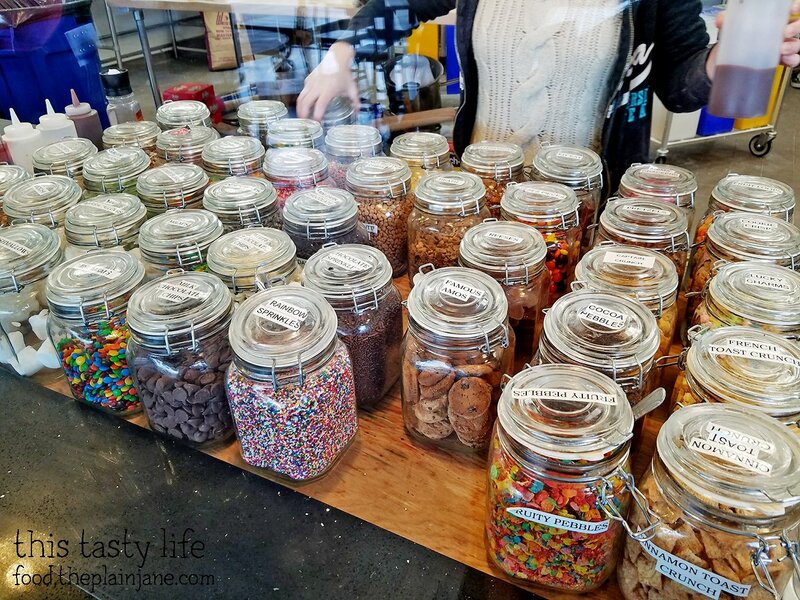 There were just SO MANY options! It’s a blessing and a curse all in one. Here’s Jake’s custom doughnut creation which I posted on IG. I think he went a little cuckoo on the toppings. He got lemon glaze on one half and apple cider glaze on the other side. 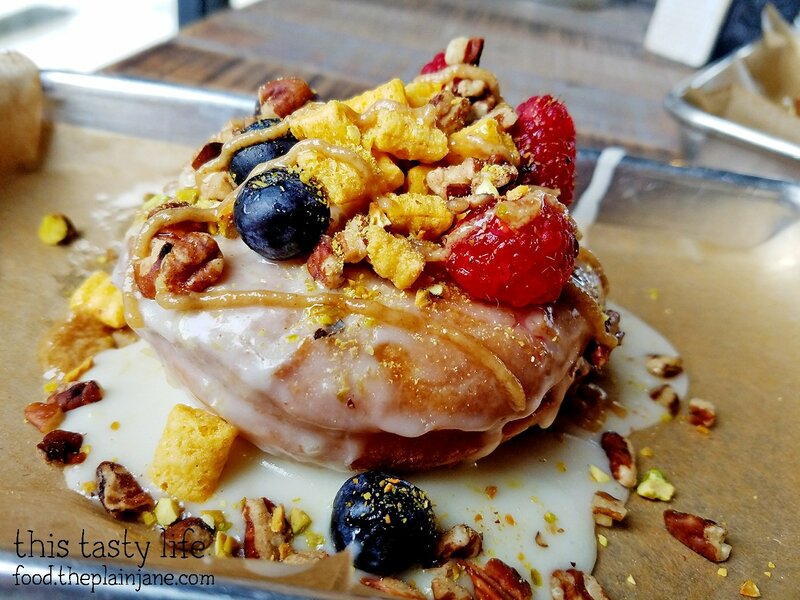 He topped it off with pecans, Captain Crunch cereal, blueberries, raspberries, and a peanut butter drizzle. I didn’t like the flavors of his. There was too much going on! T got a kinda weird one as well. 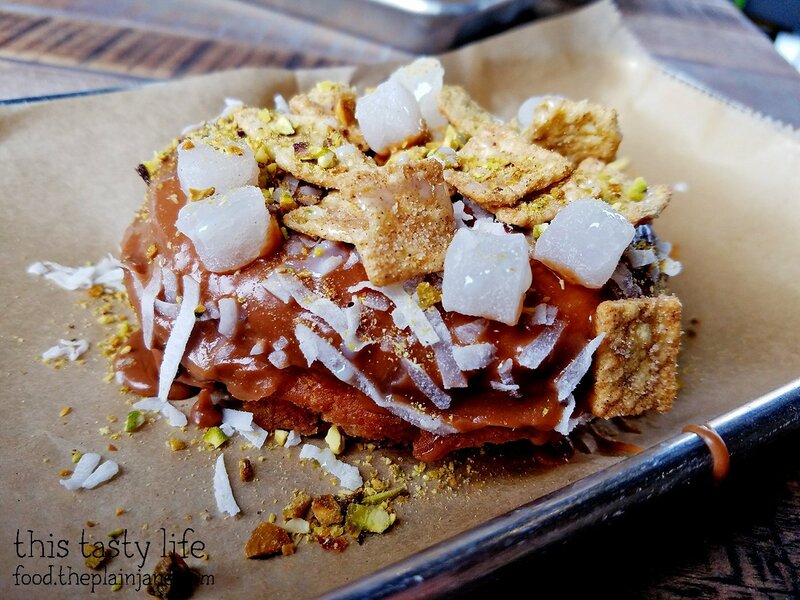 He topped his cake doughnut with a nutella glaze, coconut flakes, Cinnamon Toast Crunch cereal, mochi, and a condensed milk drizzle. I thought the coconut with the nutella and cinnamon toast crunch was also weird with the soft chewy mochi on top. I went much, much simpler on my doughnut. I got half honey glaze and half coffee glaze. The glaze on mine was really light so I couldn’t hardly taste either of them. 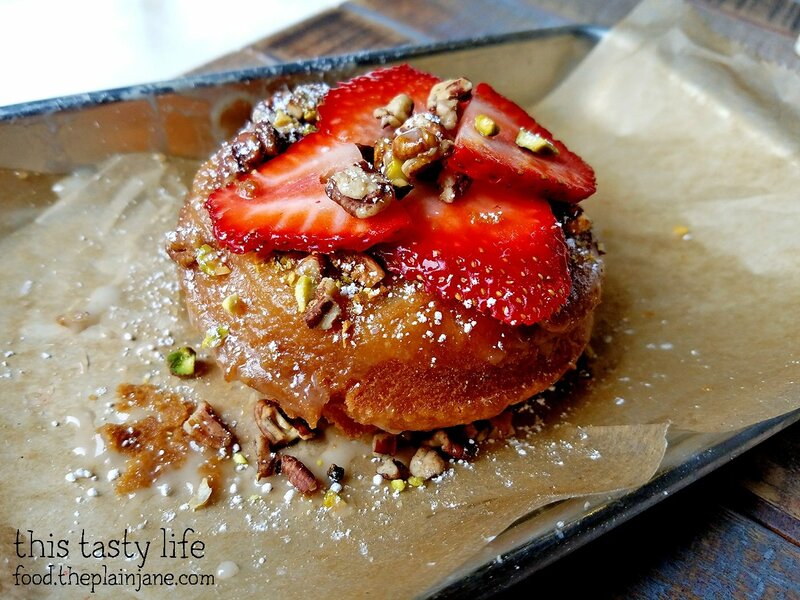 On top of the glaze I got pistachio and pecans and a few slices of fresh strawberry. For my topper, I got a dusting of powdered sugar and I was good to go. I liked my simpler flavor combination the best as I could really taste the freshness of the cake doughnut. The light glaze was to my advantage since it didn’t make the doughnut overly sweet. The nuts and strawberries gave it a good crunch and a nice bit of sweetness from the strawberries. The only complaint we had was that the cake doughnut fell apart really easily once we started digging in. But it was so fresh and so tasty that it’s really more of a minor thing. 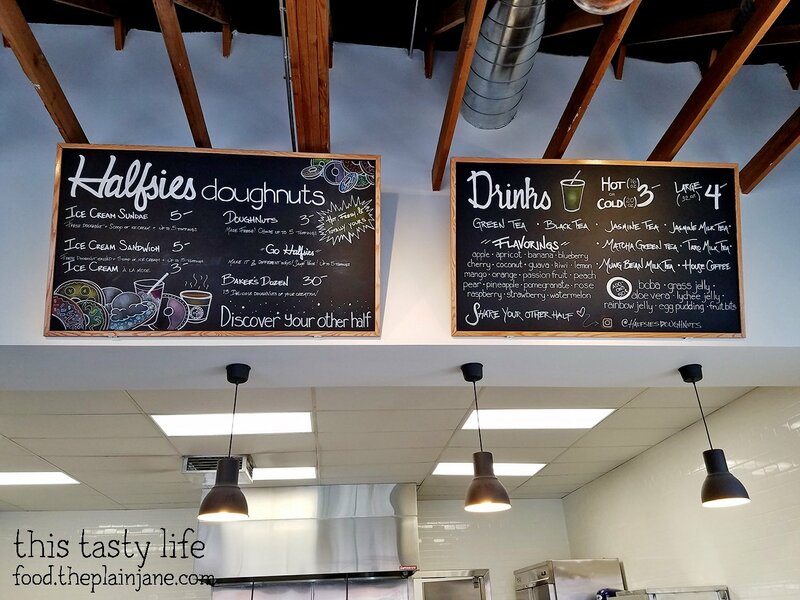 I totally recommend checking out Halfsies Doughnuts and making your own custom doughnut creation! OMG, YES. Added to my list of places to visit. Thank you.